Transplanted with her family from upstate New York in 1988 Beth now considers the Pacific Northwest home. 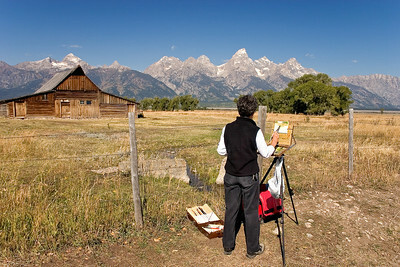 The beauty of this area may be reason enough to paint but Beth is more reflective in her motive. “The canvas gives opportunity to speak with a brush more thoughtfully of minute facets of God's creation. Though what God has made can never be duplicated the artist can offer the given abilities back to Him in an attitude of praise and worship.” Beth's landscapes are not only heavily influenced by her Christian belief but also by the Hudson River School artists of the 19th century. Their work was representational in style, depicting both intimate studies of nature as well as the magnitude and grandeur of it. Having grown up in New York State she was naturally drawn to study 'her own backyard artists' even though she no longer lived there. Beth continues her art education through personal study and workshops, using only 100% chemical free, eco-friendly M Graham & Co. oil paints. She uses no additives, solvents, or turpentine in the entire process from start to finish. Not only does this allow her a safe working environment but it also enables her clients to enjoy a finished product free of residual chemical contamination.